Adams County is located in Central Wisconsin between Wisconsin Rapids and Wisconsin Dells. It consists of 17 Townships featuring fishing lakes, trout streams, lots of public land, ATV routes, snowmobile trails and rock formations. This county is known for 3 types of industries; recreation tourism, farming and small businesses. Friendship is home to the Adams County Seat and the Court House. State Highway 21 is the main artery for East & West travel and State Hwy 13 is the main artery for North & South travel. Adams County is a well known vacation area for Central Wisconsin. It is located just north of Wisconsin Dells, one of the hottest tourist destinations in the Midwest and is known as "The Waterpark Capital of the World"! Adams County is home to a wide array of Wisconsin Lakes including Lake Petenwell & Castle Rock Lake. Some area lakes are man-made by damming up local creeks. The flowing water fills the lower land forming a body of water. Most of these are hydro-dams that help create clean electric energy that is sold to the area electric company. These lakes also provide fishing and boating recreational opportunities that bring in tourists. Tourism benefits the local economy. Part of beauty of Adams County are it's Rock Formations. These attract may tourists to this area. Most of the area is sandy soils and are part of the Central Sands Basin with a couple dozen Rock Formations popping up out of the landscape. Most of the formations are on PRIVATE LAND - Do Not Trespass! Find miles of ATV Routes managed by Monroe Prairie ATV Club and Snowmobile Trails funded by State, County and Clubs. There are several different Hiking Trails including the ones at Roche-A-Cri State Park that go around Roche-A-Cri Mound. Adams County just recently added 2 Bike Routes by Friendship WI. In Monroe Township just north of State Hwy 21, there are even Horseback Riding Trails by Castle Rock Lake just south of Lake Petenwell. Adams County has 17 Townships. Each one has some unique features including, Rock Outcroppings, Lakes, Trout Streams, Wetlands, Timberland, County Parks, Public Land etc... Each Township has the ability to have their own zoning rules. Some townships just adopt the county rules. Strongs Prairie Township stands out with unique subdividing rules that help create interesting developments like Crystal Brook Woods, Northern Bay and Dakota Forest. 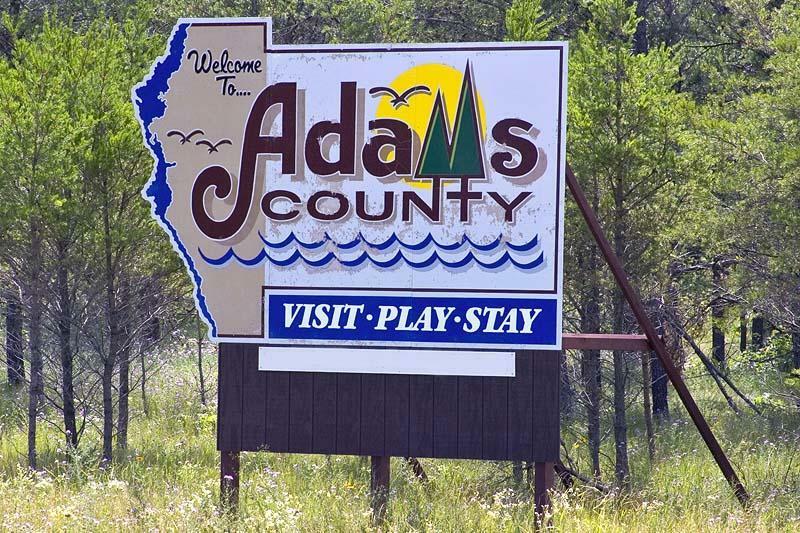 Experience Adams County Wisconsin! Area activities include Hunting, Fishing, ATVing, Snowmobiling, Hiking, Biking, Boating, Skiing, Golfing, Wildlife Photography, Birding, Canoeing, Kayaking, and more... Come and enjoy a spectacular sunset over the pristine waters of Lake Petenwell, Castle Rock Lake or even The Wisconsin River!